A couple months ago I released a quick-entry note-taking app called Stampnote for iOS. Reception has been modest; I've got a few core users that use it and really want no-frills timestamped notes. They use it to document the things they get done at work, by hour. They can then refer back to that work log and fill out timesheets or send a CSV file to their boss. I'm using it as a journal, actually. Open it up, make an entry, and exit. Later on you can see what your day looked like. For example, yesterday at 11:53am I was at the dog park, watching my schnauzers huddle in the shade of a small tree (it was too hot). To really support that kind of use, I knew I'd need to get sync working so that the things you write on your iPhone show up on your iPad. 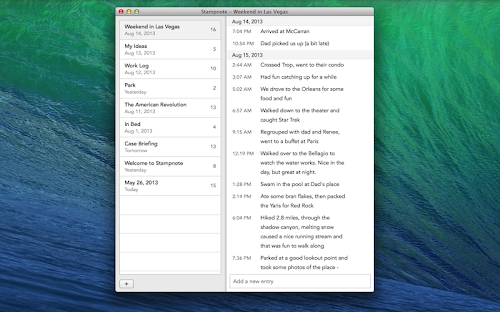 I've long wanted to build a Mac app and Stampnote seemed like a good place to start. This should be available soon, along with the updated iOS app. If you link the apps with your Dropbox account, they'll start writing files to coordinate sync. The files end with a .sync extension. You shouldn't delete them. When you load the app it'll look for changes and incorporate them. I learned a lot building the sync solution. I hope to start incorporating it into my other apps.